This story was first featured through the Presidents Group, a network of BC business leaders committed to improving employment outcomes for people with disabilities in BC. View the original story. 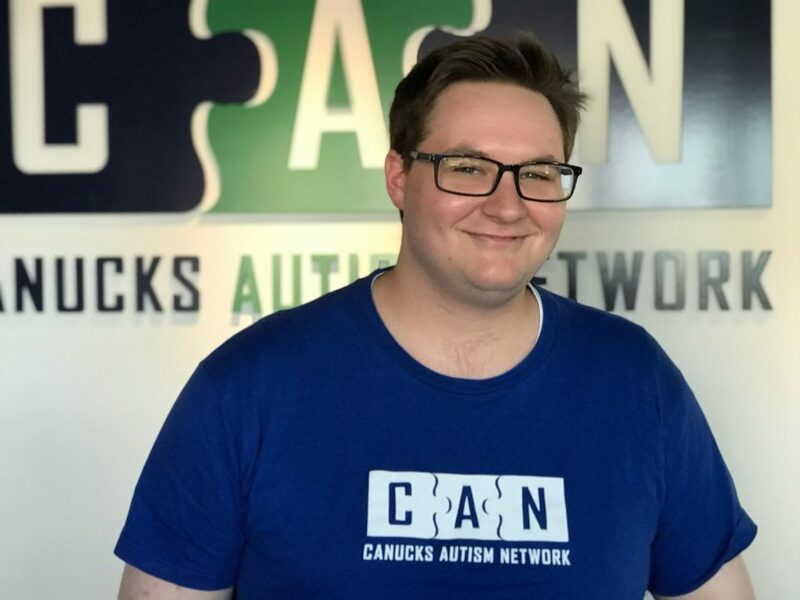 Having first joined Canucks Autism Network (CAN) nearly 10 years ago, Sylvain Formo has progressed from participant to volunteer to staff. As a volunteer in their hockey program, Sylvain used his experience as both an individual with autism and a former goalie to go above and beyond in mentoring CAN’s young athletes. Recognizing the need for his unique background and expertise, CAN innovated a new position within the program and hired Sylvain as their goalie coach. This is his incredible story. 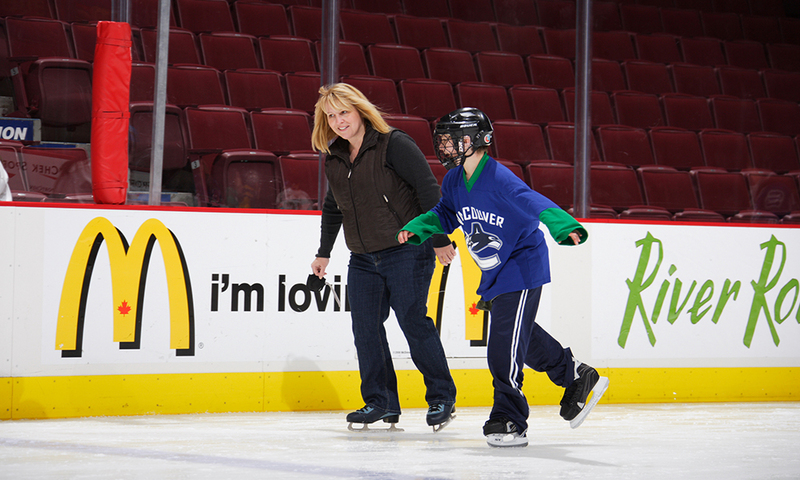 Sylvain and his mother nearly 10 years ago at our first-ever Family Skate at GM Place (now Rogers Arena). Since our inaugural year in 2008, Sylvain and his mother have accessed CAN programs and events. When CAN expanded to include a hockey program in 2014, he immediately jumped at the opportunity. As a former competitive ringette goalie, Sylvain excelled as the Vancouver Orcas’ netminder. After aging out of the program, Sylvain approached the organization with a desire to give back. Volunteering for CAN Hockey, he saw an opportunity to create the same positive experiences for children and youth with autism that he benefited from. But despite his desire to share his knowledge and insight, Sylvain arrived nervous at each practice, unsure of his ability to lead. The staff recognized Sylvain’s apprehension and slowly eased him into the responsibilities of being a volunteer. Mentored by the program’s on-site coordinator, Megan Mereniuk, he was encouraged to start by simply leading group stretches at the start of each practice. Gradually, Megan helped Sylvain progress into facilitating more drills and activities, while teaching him the basics of coaching children with autism. Sylvain’s confidence grew. Having established a trusting relationship with his supervisor, he approached Megan with the idea of preparing a separate lesson plan for the team’s goalie. At home, Sylvain spent hours researching lesson plans on Hockey Canada’s website. Before long, he had developed individualized drills and targets that were even adapted to incorporate the goalie’s love for Mario and Nintendo. Beyond his off-ice preparations, Sylvain began applying his self-awareness about autism and anxiety to inform his interactions with the participants. For example, after noticing that one of the goalies loved books, Sylvain made sure that he had an opportunity to read before hitting the ice to calm his nerves. It became clear that his acute awareness and expertise with the program’s goalies was becoming indispensably valuable. Recognizing that Sylvain was in a position to provide unique value to the team, CAN created the role of goalie coach and immediately hired him for the job. With endless humility, Sylvain credits CAN’s staff for recognizing his abilities, but being patient with him when he began as a volunteer. It is the same approach he now takes to coaching CAN’s young athletes.